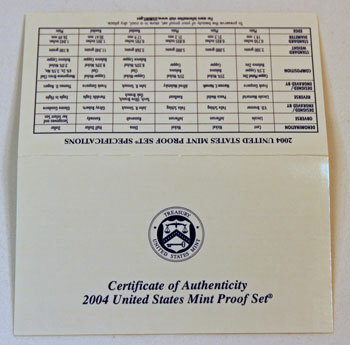 The certificate of authenticity and coin specifications for the 2004 proof set still fit on a single white card folded in half even with the addition of an eleventh proof coin. On the inside of the folded card, the Director of the Mint included a message certifying the coins within proof set. The card also had two tables. 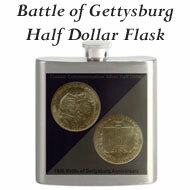 One table provided details for the six regular proof coins, and the other characterized the 2004 quarter proof coins. The outside of the folded card had a white shiny surface which provided the background for the dark blue printing of the information. 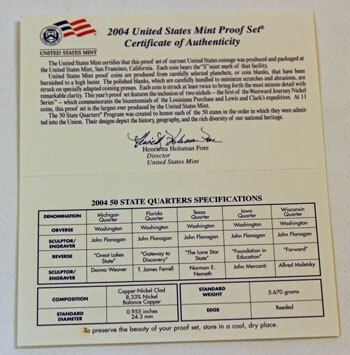 The card's front shows a US Mint seal centered above the title, "Certificate of Authenticity 2004 United States Mint Proof Set." The words "TREASURY" and "UNITED STATES MINT" circle the US Mint's seal in the white outer ring. The blue inner circle includes a white shield with a set of scales at the top, a chevron with thirteen stars in the middle and a key at the bottom. 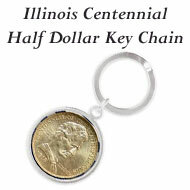 The back of the card lists the specifications for the regular proof coins: the cent, the two Westward Journey nickels, the dime, the half dollar and the dollar (scroll further for the table's details). A white matte finish coats the inside of the card. 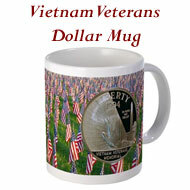 On the top half, the blue and red 50 state quarters emblem decorates the upper left corner above the Director of the Mint's message. 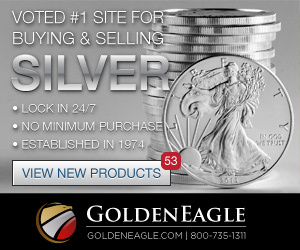 The bottom part of the card shows the table of specifications for the five state quarter proof coins. 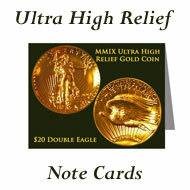 The United States Mint certifies that this Proof Set of current United States coinage was produced and packaged at the United States Mint, San Francisco, California. 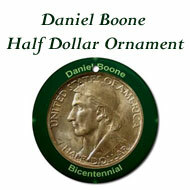 Each coin bears the "S" mint mark of that facility. 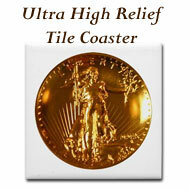 United States proof coins are produced from carefully selected planchets, or coin blanks, that have been burnished to a high luster. The polished blanks, which are carefully handled to minimize scratches and abrasions, are struck on specially adapted coining presses. 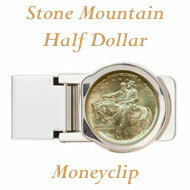 Each coin is struck at least twice to bring forth the most minute detail with remarkable clarity. 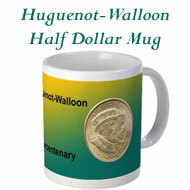 This year's proof set features the inclusion of two nickels — the first of the Westward Journey Nickel Series™ — which commemorates the bicentennials of the Louisiana Purchase and Lewis and Clark's expedition. 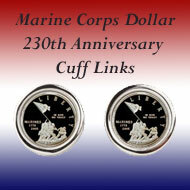 At 11 coins, this proof set is the largest ever produced by the United States Mint. The 50 State Quarters® Program was created to honor each of the 50 states in the order in which they were admitted into the Union. 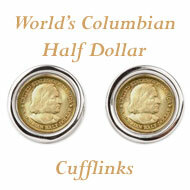 Their designs depict the history, geography, and the rich diversity of our national heritage. 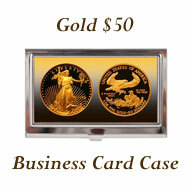 To preserve the beauty of your proof set, store in a cool, dry place. The specifications for the six other proof coins in the 2004 proof set are in the table on the back side of the folded certificate. 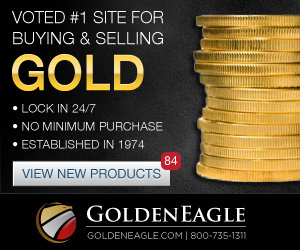 The US Mint adds their web address for more information. 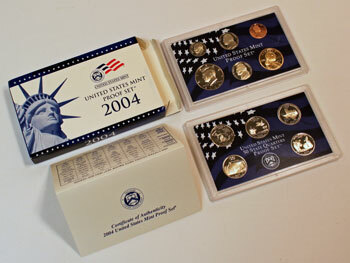 Click 2004 Proof Set to view the contents of the proof set package with its eleven proof coins.